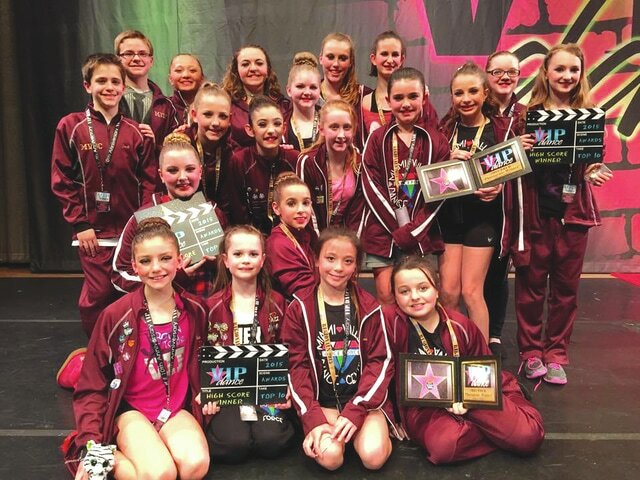 The Miami Valley Dance Center performed well at the VIP Dance Competition in April. DAYTON — The Miami Valley Dance Center Dance Force gave stand out performances at VIP Dance Competitions April 10-12 in Dayton. Across the competition, MVDC took on 19 other dance studios from across Ohio, Kentucky, and Indiana and over 689 competitive dance entries. Ruby Jazz’s “Real Wild Child” received a High Gold and placed ninth overall in the junior Broadway small group, while “Little Shop” by Ruby Tap earned High Gold and a 10th overall for mini Broadway small groups. “The Boys are Back in Town” from Emerald Tap received a Platinum and fifth overall junior in Broadway large groups. Emerald Hip Hop’s “Vanity” garnered a Platinum and 10th overall in Hollywood teen small groups. Emerald Contemporary earned High Gold for “People Help People” at the competition. Diamond Tap’s “Paparazzi” received a Platinum, the Choreography Award, was fourth overall in senior Hollywood small groups, and made it on the VIP Hollywood Top 10. Earning Platinum at the competition for “Take Me to Church,” Diamond Lyrical also received the eighth overall Hollywood teen small groups at VIP. “Whatever Lola Wants” by Diamond Jazz received a Platinum and 10th overall Hollywood teen large groups, while Diamond Elite’s “Woman’s World” scored a Platinum and placed 10th overall in Hollywood senior small groups. MVDC’s Dance Force soloists and duet competitors captured several special judge’s awards and high point placements at VIP. Alexis Minton was named a Senior Idol Soloist, received the Choreography Award, was the Top Scoring Senior Hollywood soloist, and won the Best of the Best Hollywood solos for her tap “I Wanna Dance with Somebody.” Continuing the winning streak, Julia Stultz’s “Box of Secrets” was the top-scoring mini Broadway solo and a Best of the Best Broadway solo finalist. “Stand by Me,” by Jack Cerminaro took home the Judge’s Choice Award, second overall junior Broadway soloist, and was also was a Best of the Best Broadway solo finalist. Kaylee Vance and Grant Shaffer’s duet to “My New Philosophy” received a Division Award and second overall in junior Broadway duo/trios. Placing third overall in the mini Broadway duo/trios, Brady Hooten and Madelyn Stankas performed “Dance with Me Tonight,” while Grant Shaffer netted the Entertainment Award and fourth overall teen Broadway soloist for “Friend Like Me.” Kennedy Chase’s “Hit Me” tap number was the fifth overall teen Hollywood soloist while Morgan and Bailey Fahl’s duet to “Bosom Buddies” earned sixth overall teen Broadway duo/trios spot, and Hannah Lewis placed sixth overall in senior Broadway solos for her “In the Mood” performance. Alicia Sylvester’s “Valerie” received a Judge’s Choice Award and Kendal Fahl won the Junior Photogenic Contest while Kayla Nickel, Bailey Fahl, and Morgan Fahl were Junior and Senior runners-up for the Photogenic Contest. Fans can follow the Dance Force’s progress and at the MVDC website, www.miamivalleydancecenter.com.